Target – The course is designed for postgraduate students who want to specialise in the curatorial sector, including museums, galleries, fairs or for auction houses. Previous study in the field of Arts and Management are desirable, but not essential. Methodology and structure – The curriculum of the course investigates modern and international contemporary art, as well as visual arts institutions and practices, training in exhibition organisation and public programmes in museums and not-for-profit galleries, commissioning, writing, publishing and commercial gallery activity. Area 1_Theory – The first part provides students with solid introduction to the history of post-WW2 modern and contemporary art, and a critical analysis of recent trends. The history of exhibitions is analysed in the light of museology, leading to a consideration of current curatorial strategies. Area 2_Skills and expertise – The second part is concerned with specific expertise and skills required to develop an efficient working practice in fields of exhibition organisation and management, also placing emphasis on audience development through marketing and learning, writing – as required for publication, fundraising etc. – and off-site activity. 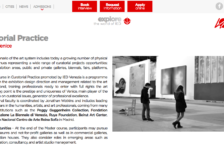 Driven by renowned professionals, this area is relevant for those wishing to pursue careers either in non-profit or commercial art worlds, in auction houses or art fairs, commissioning the production of new artwork in museums or in the public realm. Area 3_Practice – The third part deals with the issue of the design of specific curatorial projects, starting from an idea to its realisation, developed in collaboration with international Curators. During the course we have investigated different modalities of exhibition making and various curatorial approaches that are informed by the context specificity. How exhibitions are formed in relation to their specific contexts and the set of expectations that are set prior. Through exploring recent curatorial projects such as fig-2 50 projects in 50 weeks at ICA, London and Art Night, a one night only contemporary art festival, the course aimed at investigating the potential of an exhibition as a catalyst, trigger and precursor to meaning production. Moreover, we have extended the course remits to other artist research projects such as INFRA or exhibitions that are inspired by literature such as A Universe Supplementary to This One. The students visited Prague to assist for the exhibition I co-curated with Karina Kottova at Future Centre for Contemporary art, with 17 artists. During their stay, they assisted in the installation and were assigned to select and write on an art work from teh show to be reviewed during the classes in October. The course will aim at exploring the semantic, intellectual and physical qualities of an exhibitions and look at curating beyond exhibition making, in the sense in which the curatorial practice exceeds the demarcations of an art institution and its physical entity. During the assistance of the students at Ripple Effect exhibition that opened on 26 September at Futura Centre for Contemporary Art in Prague, all students are assigned to select a work of art and write a review on the piece to be reviewed at the class. Moreover, the students will be presenting their collaborative project and their set of artists they are putting together and will be assigned to write a curatorial statement at the course to be reviewed all together. Lastly, their reviews of the selected exhibitions in Venice will be assessed together. Through these practice based teaching, the students will be trained in exploring modalities of curating, from site to selection of works and the choreography of display.